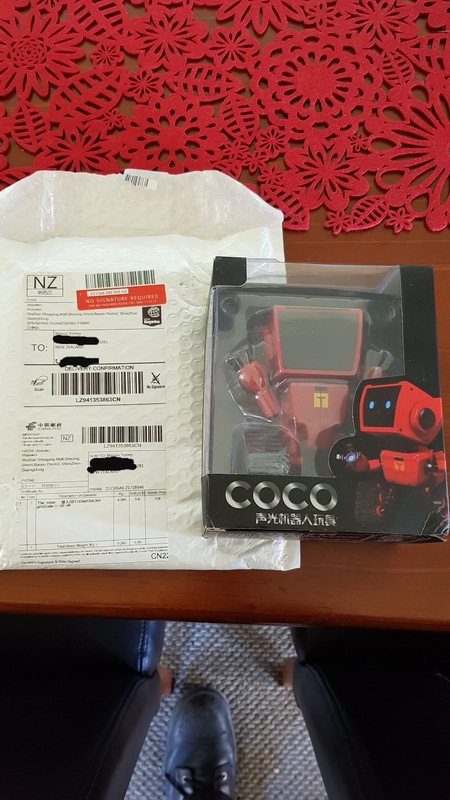 This is a scam by Everyonedays who have scammed many, many people by advertsing Cosmo Intelligent Robot, but sending the item in the following image. This is a plastic doll that does nothing but say something in Chinese while its eyes flash. That's it. No intelligence, no movement, nothing. Notice on the packaging that they've stated that the item in the package is only worth US$5. I paid NZ$51. 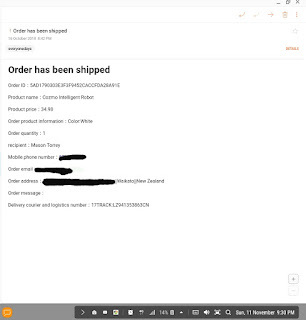 The following are screenshots of the purchase and shipping confirmation. The following are a few more screenshots related to this company and my purchase. The following is my correspondence between them and myself. 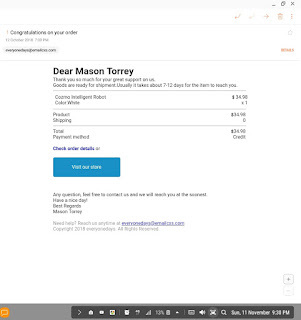 Read the email from the bottom up as each new email is added to the top. I managed to get a full refund only by sheer perseverence by emailing them constantly over a six week period. They pushed my patience hoping I would fold and either give up altogether, or just accept their 65% refund. Thank you. I appreciate you coming to a reasonable agreement. We will give you a full refund in 7-15 business days. Please note that. We are really really so sorry for the unhappy experience. Please kindly accept our sincerely apologize again. As in have stated, I never received the product I ordered. I made no mistake, you made the mistake. You're responsible for fixing the mistake, not me. We are so sorry that if you want a full refund,you must send it back to us,we will refund you after we receive it. No, not 65%. You owe me a 100% refund since I never received the product. We will give you a 65% refund in 7-15 business days. Refund to the payment method of the product you purchased at the time. How about accepting a compromise to keep the item and gain a 65% refund?Are you agree it? Give me a refund. If you want the cheap piece of plastic back, you pay shipping. We are so sorry that the goods you received can not meet your satisfaction. If you send the item back to us, the shipping costs are expensive. How about accepting a compromise to keep the item and gain a 65% refund?If you want a full refund,you must send it back to us,we will refund you after we receive it. I didn't ask you to send a plastic doll. If you want it back, you pay the shipping. 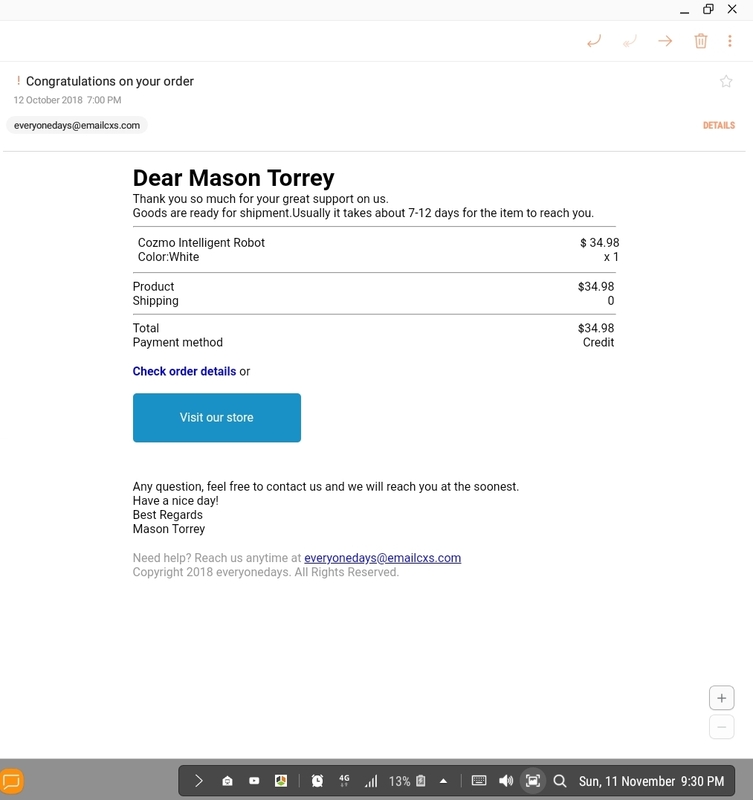 I paid for Cosmo Intelligent Robot and you never sent it. Either you send it to me, or give me a full refund for the goods that I never received. We are so sorry for that if you want a full refund,you must send it back to us,we will refund you after we receive it. If you have any decision, please feel free to contact us, we are more than happy to serve. Because you refuse to give me a full refund despite the fact that you scammed me, I'm taking this to the media so everyone is warned about your scam. I'll provide the screenshots of what you promised to send me and also these emails that prove that you refuse to refund me in full. How about accepting a compromise to keep the item and gain a 65% refund?We are sorry that this is the highest refund we can give you.If you want a full refund,please send it back to us,we will full refund you after we receive it. Because you will not refund my money and you are deceptive and take money from people for items that don't exist, I'm informing our country's media so they can warn everyone else about this scam so no one else is taken advantage of by you. Please note that you have to pay the shipping fee. We will full refund you after we receive it.And after you have sent out the parcel ,we hope you can provide us with a logistics number for us to check . If you have any questions, please feel free to contact us, we are more than happy to serve. You advertised the Cosmo Robot. I watched the video and read the advertisement which showed and described the Cosmo robot. You sent me a doll in the shape of a robot. I can buy a doll like this in a store for less that $2. You are deceptive and you continue to lie about this. I expect a full refund. If you want this $2 piece of plastic to be returned, you pay the shipping cost. It's your fault that this has happened, not mine. We are so sorry for that the goods you received can not meet your satisfaction. And if you do not need this any more. You can return it back. But you have to pay the shipping fee. We will full refund you after we receive it. Please keep it original,don't effect the second sale.We are very sorry for your inconvenience. Your reply is definitely not acceptable. Through your false advertising I ordered the Cosmo fully functional robot. You're advertisement included a video of the Cosmo robot and specified what was included with the purchase which was the Cosmo intelligent robot, the three cubes and instructions on how to interact with the robot. What you sent me wasn't a robot at all. You sent a doll in the shape of a robot which I can buy from a store for less than $2. I expect a full refund. You can choose to return the goods to us. We will give you a full refund. But you need to pay the shipping cost because our company does not support free returns and exchanges. Waiting for your reply and Have a nice day. If you think this solution is not acceptable, please contact us and we will try our best to serve you. Stop lying about the advertisement. Your advertisement was for Cosmo robot. You sent me a cheap toy. Give me a refund. The product you receive is the product in the advertisement. The pictures in the advertisement are post-processed. It is normal to have a difference with the actual object. Sorry for your dissatisfaction with our product. 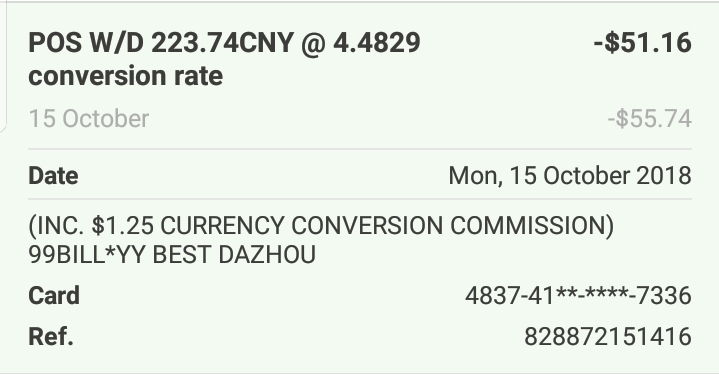 As for the rule of Paypal,you need to return the item to us,and pay for the freight,this fee may beyond 10 USD,received the money after we received the item. So to avoid those troubles,how about we refund you 50%，and you can keep the item.OK? Please let us know your decision,we will process accordingly. This is your fault that I should receive a refund, not mine. You didn't send what I ordered. You can also accept our apologies and we will refund 50% for you, you can give it to your friends or family as a gift, ok ? Or simply resell it if you could find someone who needs it. We are sorry that we didn’t receive what you sent pictures,please try it again. I sent you the invoice already. I expect a full refund. That fact that you don't resend items isn't my problem. Your advertisement was a lie so you are responsible to refund me in full. Can you provide your Invoice ID（Like c.XXXXXXX.1） when you purchased it?Or provide the delivery tracking number on the package label. We are so sorry for that the goods you received can not meet your satisfaction. As our company don’t support to resend the item. How about accepting a compromise to keep the item and gain a 25% refund? I've sent photos as you requested. I'm still waiting for my refund. We are sorry that can you provide some pictures for us?We need to check it. So what's happening? Are you going to refund my money since you lied to me about the product I purchased? Could you please do us a favor to provide us some pictures（with the shipping label and product ID on the package） to show what do you receive and the screenshot of your order info（with your order number） ? 1)open the link, then click"send date using link"
Really appreciate and hope to hear from you soon! I orded the Cosmo Intelligent Robot as shown below. What arrived is something completely different and I'm not happy. I would like a refund. Goods are ready for shipment.Usually it takes about 7-12 days for the item to reach you. Copyright 2018 everyonedays. All Rights Reserved.